I decided to make people Christmas presents last year, and thought I’d make my Dad a weather station. That’s the kind of thing parents like. I wanted to make something a bit nicer looking than an ugly circuit board so had the idea of attaching the wires to a piece of wood. In the end I had to make it in about a day, just before Christmas, and so it didn’t end up as neat as I would have liked. However, I think the result is still pretty nice/interesting. Something I will definitely try again, perhaps with more time and planning. The heart of the actual weather station is an Atmega328 with an arduino uno bootloader. For the sensing I use an MPL115A2 pressure and temperature sensor, conveniently broken out by Adafruit. For the humidity I use an DHT22 temperature and humidity sensor. Though since I already have a temp sensor I ignore this one. It is pretty straight forward to get the arduino and sensors talking and displaying the humidity, temperature and pressure on screen. 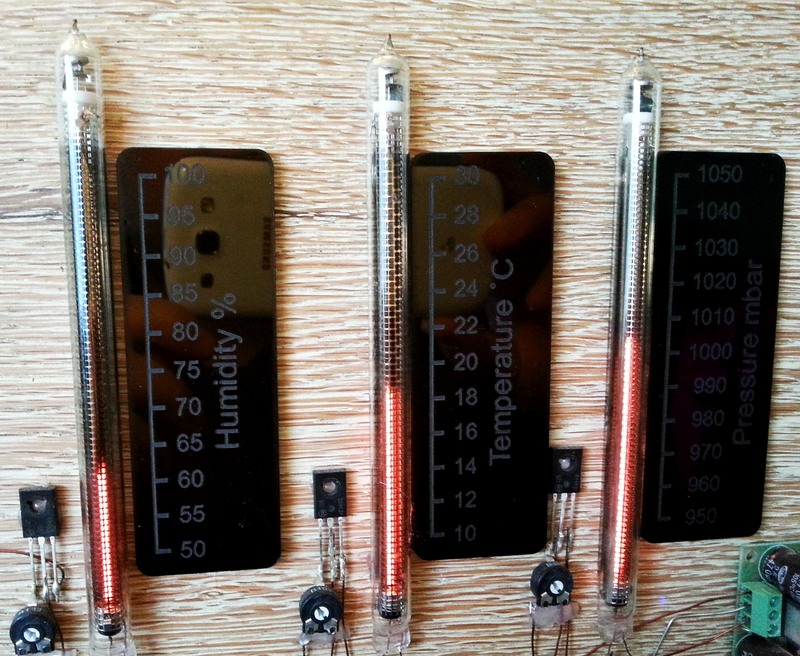 To display it on the weather station I decided on 3 nixie IN-9 bargraphs, as previously used on my clock project. These need a 140v supply which I bought as a small board (visible on the bottom right). To control the height of the plasma the current through each tube needs to be controlled. To achieve this I map the humidity, temp and pressure values to 3 PWM outputs and pass through a low pass filter, with a time constant of about 1 second. This gives a pretty good DC voltage. This is then fed into the base of a high voltage transistor. This then controls the current through the tube. Much simpler than it might sound. Check out my clock instructable for how to control the nixie tubes with an arduino.